The year was 1970. John A. Ennis, Sr. was working in the electrical contracting industry, but wasn’t happy with how employees were treated. His boss at the time asked him to complete a challenging job, promising him a bonus if he succeeded. John drove more than 100 miles every day—each way—while working on the project, eventually finishing it under budget. While the client was pleased with the project, John’s boss didn’t hold up his end of the deal. John quit on the spot. 1972. After he left the company, John received a call from the contracting officer in charge of the project he quit over. The contracting officer asked John to bid on the second phase of the project—a contract John then bid on and won. He formed a partnership with his initial business partner, Jerry Nelson, and Virginia Electrical Contractors was formed. The two successfully completed the project and continued to bid on—and win—new contracts. As the company grew, so did financial responsibilities. John was more comfortable with the trajectory of the business, so Jerry bought out John. 1974. With just two trucks and four employees, John founded and incorporated Ennis Electric, creating a legacy for high quality work, performed on time. The most important precept of the company was—and still is—that no employee would ever be treated poorly or unfairly. The second tenet was that the company would never accept more work than its coworkers could handle, in order to maintain the high standards of the company. Over the years, the company grew. William “Chip” Swab, the company’s first apprentice, became president, while John continued as CEO. For the next 20 years, Chip led the business and focused on employee growth, encouraging coworkers to reach their full potential. John retired in 2004. His eldest son, John Ennis Jr., who started in the company as an apprentice, joined Chip in leading the business. Together, they developed a management team and set a tempo for continued growth and expanding capabilities, while maintaining the highest standards. Chip retired in 2011. Today, the day-to-day leaders of the company are John Ennis Jr. in the role of Chief Operating Officer and Stephen Blankenship, who also started in the company as an apprentice, as President. 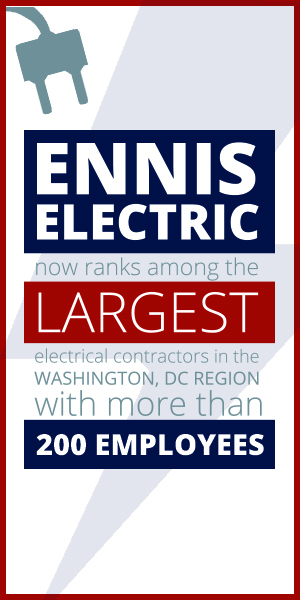 Ennis Electric now ranks among the largest electrical contractors in the Washington, DC region, with more then 200 employees. John Jr.‘s mission has always been to continue his father’s vision—delivering quality work in the construction industry, but also making sure each employee is valued within the company and has a real stake in its operations. To ensure the continuity of Ennis Electric as a locally owned and operated company, and to inspire and reward employees, John Jr. established an Employee Stock Ownership Plan in 2012. As a result, every employee has a vested interest in the successful performance of the company. 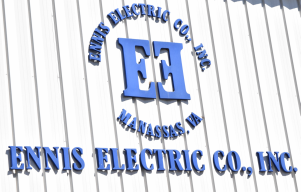 Employees now own 51 percent of Ennis Electric.